It was through the efforts of F.F. Moore, Rochester, Indiana, that all of these associations and recording offices were combined into one recording, association. 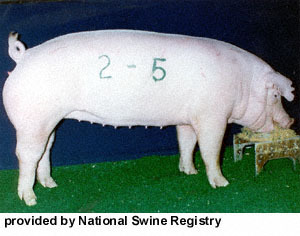 This association was named the Chester White Swine Record Association, with headquarters in Lima, Ohio. Eugene Black, Scio, New York, and F.F. Moore was the first president with offices in Rochester, Indiana, the first secretary. All of this gathering and combining of associations started about 1911. This trend continued until 1930, when the Chester White Swine Record Association was reincorporated under the laws of Delaware, with offices in Rochester, Indiana. The offices moved to Peoria, Illinois on June 1, 1986 (and this is the present location). Arthur Tomson became president in 1930 and served in this capacity until 1963. Levi P. Moore became secretary of the association in 1931 and served until 1968. J. Marvin Garner became secretary in 1968, upon the retirement of Levi P. Moore. Larry Rus assumed the secretaryship in 1969, following the resignation of J. Marvin Garner. In 1973, Lyle R. Alumbaugh became the secretary following the resignation of Larry Rus. In 1977, Daniel Parrish became secretary and still serves in that position.